I love the Wayne Gretsky quotation, "I skate to where the puck is going to be." Is it possible that the grizzly bears of Alaska and Canada learned from Wayne? They don't use fishing poles and they can't grab salmon, but they wade the rivers and position themselves where the salmon will be jumping . . . sometimes right into their mouths. For me, I go to good restaurants where the salmon eventually finds its way into my mouth. I live in the rainy and often overcast Pacific Northwest, but have salmon almost at my finger tips 365 days of the year. This is good because salmon is one of the superfoods, containing healthy unsaturated fats and vitamin D. Victoria J. Drake, Ph.D. and a research associate at the Linus Pauling Institute at Oregon State University says, "When sun exposure is insufficient for the synthesis of adequate amounts of vitamin D in the skin, obtaining vitamin D from foods or supplements is essential for health. However, very few foods naturally contain vitamin D. The richest sources of vitamin D include oily fish, such as mackerel, salmon, or sardines; fish liver oils; and eggs from hens that have been fed vitamin D." You can learn more about vitamin D by visiting the LPI section of vitamin D, or the section on omega-3 fatty acids from the oily fish. I like sardines, but the joys of canned mackerel just escape me. I'll have to look at my egg content to see which ones were fed vitamin D. Salmon, however is a family favorite: baked, fried, sushied . . . you name it, we love it. 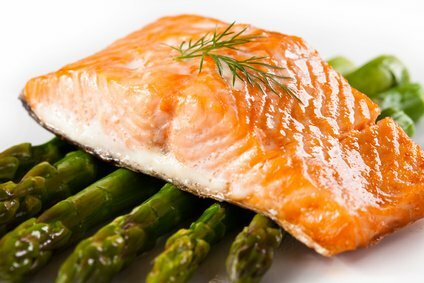 There is so much oil in each salmon that it's almost impossible to overcook, yet many restaurants succeed. When I get overcooked salmon I complain. If it happens twice at the same restaurant I don't return. I've been a salmon snob for some time and refuse to even consider dining on Atlantic salmon, which is mostly farm-raised. I have been under the assumption that farm raised salmon isn't as good for you as Pacific salmon. A local fish-monger, however, told me that Atlantic salmon makes the best smoked salmon because of its high oil content. I may have to sample and research. 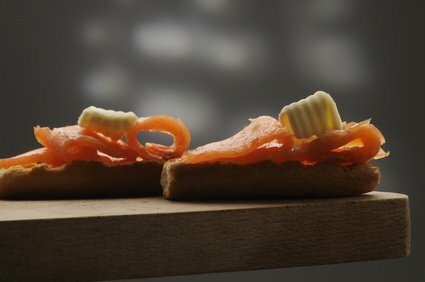 Smoked salmon is a great snack item here in Washington State. It can be served thinly sliced with a little lemon or lime juice on toasted whole grain squares (bread from Roman Meal for example) for even more health benefits. I live only a couple of miles away from two different fish and seafood shops. Sometimes I just stop in and buy a smoked chunk of salmon to munch on while I drive home. On a good day I'll make a couple of round-trips. My favorite is the smoked salmon bellies. If I can buy regular salmon bellies I cook them up in stir-frys. 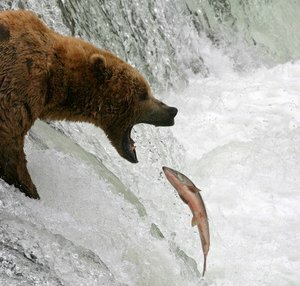 The salmon bellies contain lots of oil and it's what bears love to munch on first. One of the local seafood shops has a steady supply of steelhead. These are seagoing trout. Trout are from the salmon family. The steelhead are farm raised, too but here in Washington in the cold north Okanogan area of the Cascades and eastern Washington. The flesh is paler than normal salmon, but very, very moist. Priced below comparable Pacific salmon they taste every bit as good . . . or better, but that might be Peg's cooking. I'll have to investigate their omega-3 oil and vitamin D content, but I'm hoping they're as good as the Pacific wild-caught salmon numbers. Superfood Salmon and Omega-3 Oils, Salmon and Ice Skating Bears, salmon nutrition, salmon nutrition article, superfood salmon, healthy oils Omega-3 fatty acids.